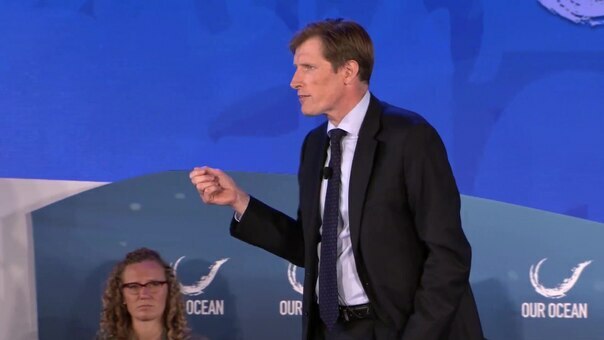 Dr. Jonathan Pershing Special Envoy for Climate Change, U.S. Department of State moderates this segment of the Our Ocean conference. Special address from Her Excellency Ségolène, Royal President of the COP 21, Minister of the Environment, Energy, and Marine Affairs of the French Republic. Scenesetter is Dr. Kristy Kroeker, assistant professor, Forestry Research, University of California Santa Cruz. Speaking on solutions are: Mr. Samuel Leupold, CEO, DONG Energy Wind Power; Dr. Daniel Murdiyarso, principal scientist, Center for International Forestry Research; and The Honorable Kathryn Sullivan, Under Secretary of Commerce for Oceans and Atmosphere, National Oceanic and Atmospheric Administration.